The sounds and words have great effect on mind, body and soul. So the sounds, words and music you listen to has a deep effect on your thought process and your health as well. The Bhajans presented here are downloaded from various sources like YouTube, Jain Websites and Jain CDs. The purpose of presenting the Jain Bhajans here is pure and non-profit. Wear clean clothes, wash your hands and feet and if you have eaten something make sure to gargle and clean your mouth. Choose a quiet place so you can concentrate on the swadhyay. Turn off your mobile. Make sure the time is appropriate for the particular shastra swadhyay. Start with mangalacharan of the shastra you are listening to. For example for Ratankarand Shravakachaar recite "Namah Shri Vardhamanaya nirdhoot kalilatmane, saalokanaam trilokanaam yad vidya darpanayate". Learn new Jain Bhajans ... click here for more information ! 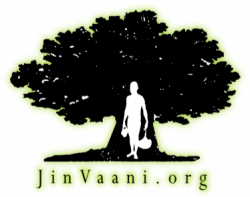 Contribute Content for JinVaani Site: Please send us your content here, if you have any rare Jain pravachan, granth, book, picture or bhajan of any Saadhu or Sadhvi in audio/ video or any document format.